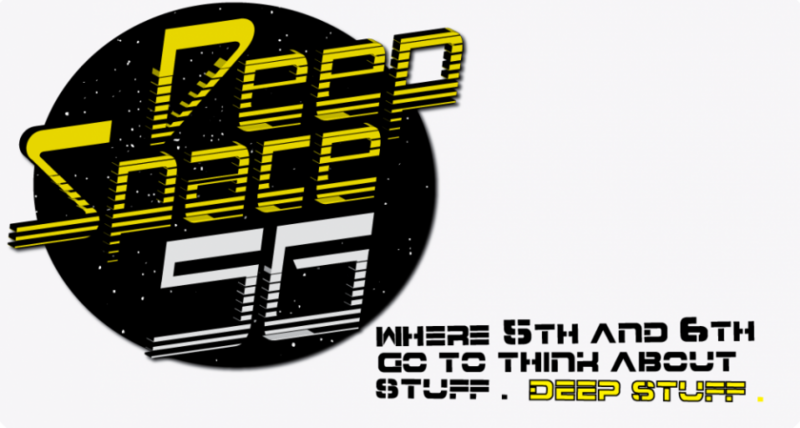 Deep Space 56 - Where 5th and 6th go to think about stuff. Deep Stuff. Pre-Register for quick drop off HERE or keep reading to find out more. Chances are if you know any 5th and 6th graders you have been blown away by how much they seem to be transforming. This is not a bad thing. They are morphing. You could say they are being teleported into teenagehood. Attitude, cynicism, questioning, confrontation. Suddenly they have well thought out reasons complete with a list of probability algorithms as to why they shouldn’t have to do chores. Yet they retain their child sensibilities that we so desperately need and miss as we get older. So we take them out of our normal Sunday Morning ranch theme and calmly shoot them off planet. We find that they both enjoy the intergalactic journey and the cheese like surface of the moon. And there will be cheese. However, this type of program pushes them to think outside of our water heavy sphere and look to things above. After all 5th and 6th are an instrumental and special addition to our church community. So we seek to create a place especially designed for them. A place where they can play and study and grow and think. Think about metaphors and why moldy cheese tastes better the moldier it is. A Place To Think About Stuff. Deep Stuff. This is also the age in our Children’s Ministry where we focus intensely on the Bible. God Has a Special Book for us. With their unique wiring 5th and 6th graders are the prime age for digging deep into the Bible. Suddenly context, metaphors, meaning, multiple translations, audience and history all matter and can be understood. We seek to help 5th and 6th graders dig deep into the same old Bible stories they’ve heard since they were two and understand them and be excited about them. Lastly we work closely with the Jr. High and High School leaders to ensure 5th and 6th can have a safe and positive re-entry process as they wrap up their Deep Space exploration. Jr. High after all can be a special shock to the system. This means, as we do in all of our children’s ministry, that we work closely with parents providing opportunities for them to take off with their kids. Want to be a Deep Space Ranger? Click HERE to apply.